As promised, one last post before the end of 2017. Among the many events of the last two weeks of term were the Staff-Student exchange meetings my colleagues and I have with the student representatives of undergraduate and postgraduate programmes. These are always really interesting and constructive sessions – opportunities for all of you, via your reps, to feedback any issues to us, and for us to respond, and sometimes take away issues for further discussion with the whole department. An example of the rapid working of this mechanism was the discussion about the longer-than-usual Christmas closure of the library and the deadline for MA essays. The reps at the post-grad meeting made an eloquent case for the extension of the deadline, which normally falls on the first day of the Spring term, for an additional week, to 15 January, and we agreed. Democracy in action! On the 14th November, we visited both the Bishopsgate institute archive and the British museums archive. Being a totally new experience I didn’t know what to expect. 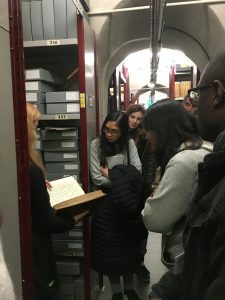 The archive at the Bishopsgate institute was a surprising and humorous visit all thanks to the archive manager Stefan Dickers, who was full off anecdotes regarding his collection. He explained that the archive collects items that are viewed as history from below. The archive does this by collecting from areas like the working class, LGBT community, radical and social history. The reason they collect these items is because often it is this history that is forgotten and the archive acts to preserve them. If you get the chance to visit the archive, then go, even just to listen to Stefan talk about the archives collection or to see their collection of leatherman posters or old take away pizza menus. The British museum’s archive on the other hand was something else altogether, over 200 years of the museum’s history is stored within but in no apparent order. As the Museum is a publicly funded institute its archives are considered to be public records and are available for public access. However the British museum archive is typical of a large institute that is very old – the archive materials have been poorly classified, because in the past the museums interest was mainly focused on its collection. It was interesting to me to see how two archives could be so very different from each other. An opportunity for the budding young art critics among you (and I say ‘young’ advisedly): the Burlington Magazine has announced this year’s Contemporay Art Writing Prize, with a deadline of 26 February. It’s specifically for aspiring, rather than established, writers, which is good, but it has a maximum age limit of 35, which is bad, and very un-Birkbeck! More here. 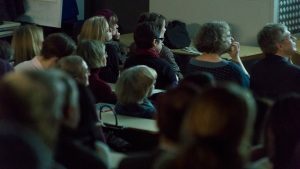 Missed Gabriele Finaldi’s Murray lecture on the National Gallery and the Prado, or want to catch it again? Now you can listen here. 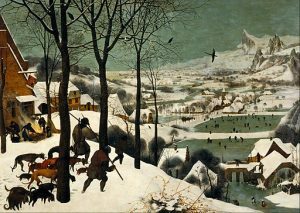 I’ll leave you with a seasonal art historical scene, Peter Bruegel the Elder’s Hunters in the Snow (Winter) from 1565 (thanks to Vienna’s Kunsthistorische Museum and the Google Art Project). You never know, we may get more of the white stuff! Last Thursday November 30th was an exciting moment for us – the launch of Opening up Art History: 50 years at Birkbeck, our programme celebrating the anniversary of the department’s founding in 1967. Our kick-off was, appropriately, the Peter Murray Memorial Lecture, named for the founder of the department. 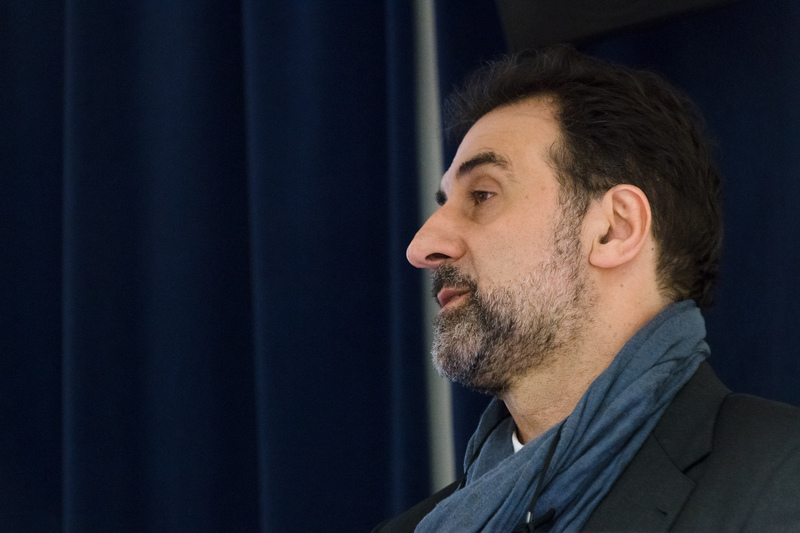 We welcomed National Gallery director Gabriele Finaldi with a full house and a warm reception for his fascinating, wide-ranging talk about the divergent histories of the two institutions he knows best, London’s NG and Madrid’s Prado, where he was deputy director until recently. 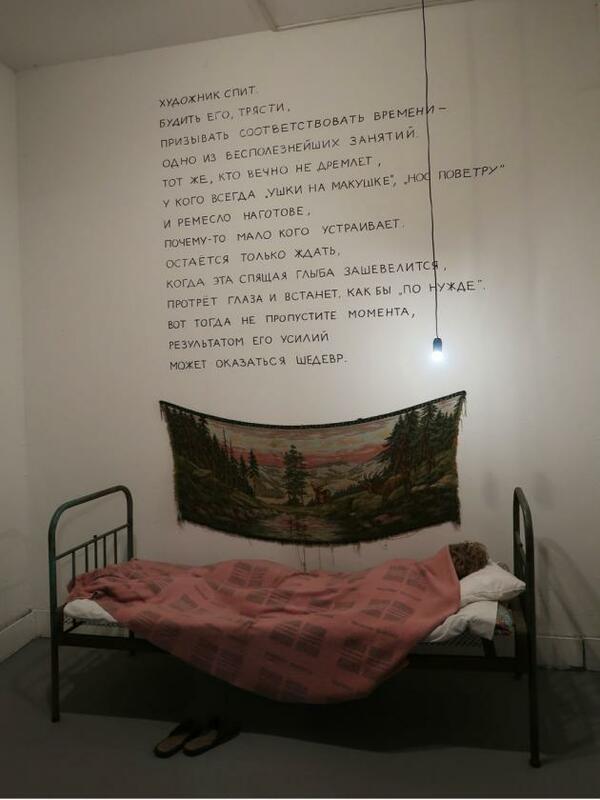 Francesca Castelli, a BA History of Art grad and currently a MA Museum Cultures student, has written an excellent blogpost about the lecture, and there’ll be a podcast available soon. One thing that struck me about the evening was how alive our history is and how connected we are to it: Gabriele talked about how important Peter Murray’s catalogue of the Dulwich Picture Gallery was to him when he first encountered history of art in Dulwich, and sitting in the front row were Peter Draper and Francis Ames-Lewis, the two first colleagues hired by Prof Murray to help teach the first Birkbeck art history students, one of whom, Clare Ford-Wille (one of our Associate Lecturers) was also there. Turned out Gabriele’s own father had done a degree at Birkbeck in the mid-1960s – in Italian and French rather than in History of Art, but we’ll forgive him for that. And a tip if you want to find out more about Gabriele Finaldi, his vision for the NG, his own background and his musical tastes: check out the podcast of this Private Passions episode on Radio 3. The Murray Bequest funds the Peter Murray lecture, and is contributing generously to our anniversary programme of events, for which we’re very grateful indeed. This is in addition to their support for all sorts of other activities within the department, including the Murray seminar, which features leading scholars of medieval and early modern art in free research talks between 5 and 6pm, several times per term, in the Keynes. The last one for this term is on Wednesday 6 December: Cecily Hennessy will speak on ‘Mary Magdalene in Byzantium’. Another ‘beginning at the end of term’ is the fabulous news of the revival of the History of Art Student Society, a society for all current students in the department. Please take this society to your heart and make it your own! Their first event is an end of term Christmas party on Friday 15 December and here’s the very art historical flyer. Fancy an opportunity to travel expenses paid to Venice for a month and be part of the British Pavilion at the Venice Architecture Biennale? Two School of Arts students will get that opportunity in 2018, thanks to the British Council Venice Fellowships. The first thing to do to find out more about it is to come along to a briefing on Tuesday 12 December at 5 in room 106, where a rep from the British Council and the two Birkbeck 2017 fellows will tell you all about it. Note that all History of Art (and School of Arts) students are welcome to apply – no need to a particular background in architecture. For further info please see the email circulated, or contact Sarah Thomas: sarah.thomas@bbk.ac.uk. Some research news: Kasia Murawska-Muthesius will be giving a paper with the intriguingly pithy title ‘The Satirical Object’ on Wednesday 6 December at University of East Anglia. Kasia’s talk, coinciding with the Sainsbury Centre’s recently opened exhibition of the work of Roger Law, of the Spitting Image fame, will address the relationship between caricature and puppetry. Does the affinity between them extend beyond the formal terms, i.e. the principle of deformation, and subversiveness, which informs both of them? Among other shared features to discuss are anthropomorphism, performativity, ephemerality, and reflexivity. The RA has recently announced a new free exhibition ticket scheme, as it prepares for its 250th anniversary year in 2018 (anniversaries are clearly all the rage at the moment). It is available to any student studying History of Art at a Higher Education Institution. To be eligible, students need to register their details with the Royal Academy using the form on their website: roy.ac/freestudenttickets. Once you’ve registered the RA will email you to let you know when tickets have become available, and to invite you to book. There will be a limited number per show, which you can reserve online, up to two tickets per person. I’d really encourage you to jump on this one – the RA exhibitions are some of the best, and most expensive, in London.